Let's Take A Look At The Numbers Tonight "The Blackman Read Aloud Hour"
Since I am a resident of the State of Maryland I would like to spend some time writing about some numbers. No matter what state you reside in the literacy percentage numbers for African American students enrolled in public school systems across America is in this range or far worst. 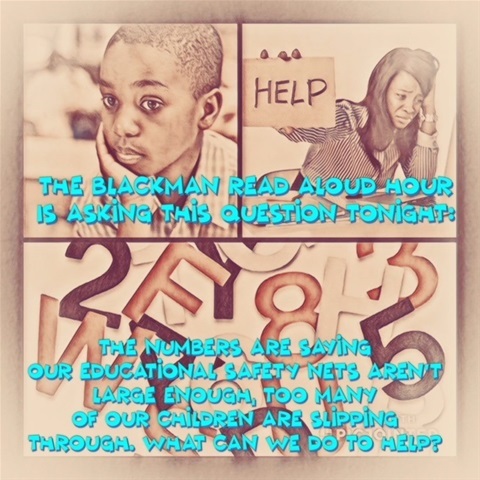 Let's talk literacy proficiency numbers in Maryland this evening. Of course, the highest percentage of African American students are enrolled in either Baltimore City Public Schools or Prince Georges County Public Schools. In relationship to reading proficiency including advanced readers, Baltimore City Public Schools has a percentage of 18%, which means that 82% of Baltimore City Public School's students are functioning either at basic or below basic levels related to reading proficiency. Looking at the numbers for Prince Georges County Public Schools in relationship to reading proficiency 31% of Prince Georges County Public School's students are functioning at proficient or advanced while 69% of the county's students are functioning at basic or below basic levels of proficiency. Overall in the State of Maryland, our African American students comprise the greatest percentage of students reading at the basic or below basic proficiency levels throughout the 26 counties. It is imperative that you and I understand reading as well as math proficiency levels. The one concept that runs true is this if a child isn't proficient in reading the likelihood is that same child will also not to be proficient in mathematics. That's why it is so vital to have a comprehension of these figures because like it or not our black community must strategically model plans to erase both reading and math illiteracy. How can our children participate in STEM projects if they are unable to compute or read? That's why I see my model of The Blackman Read Aloud Hour as an effective resource for our children. It not only allows them to see and heard a proficient reader consistently but it also opens the door to an understanding of the vast magnificence of our black ancestors. So please make a small contribution to the cause of making this campaign a national campaign that will enlighten our students to effective strategic read-aloud sessions and provide them an opportunity to gain historical knowledge. Are you that Blackman Who Reads Aloud, I Am, You Can Be Too. Make A Contribution To My GoFundMe Campaign today.